Ibeyi- Lisa-Kaindé Diaz and Naomi Diaz Featured in Lemonade also twins from Nigeria (French-Cuban) of Yoruba decent that sing in both Yoruba and English well known Yoruba folklore group. Popular in America but more so Europe. Sing much of the God Osun, found on their song River. Laolu Senbanjo– Painted all of Beyonce’s artists but also collaborated with Nike on some new African inspired designer shoes. Hugo Canto- Re-imaged Marvels Revengers cover with Yoruba Gods and became very successful for doing so. The idea of using traditional African influences for identity in African Americans is known as Afrofuturism (term comes from Mark Dery in 1993). It allows an alternative reality for blacks in the present to become the new reality. As a way of rebirth and starting over. “Unapologetic Black and Female Albulm” Lemonade. Hold Up: An update and second most popular song on Beyoncé’s album, she appears to channel Oshun, the Yoruba goddess often wearing yellow and using water as a form of power and renewal. Beyonce starts the scene by wearing a Roberto Cavalli dress in yellow with gold jewelry and bare foot showing her connection to the earth. She opens two large golden doors that poor out water showing this dream-like state. Folktales of Oshun describe her malevolent temper and sinister smile when she has been wronged which you can see in Beyonce as she walks down the steps bare foot and all with a baseball bat hitting water hydrants and cars as she goes. Following the reading, we are shown “Boy Bye” where Beyonce and follow women are on a bus with their faces covered with Ori*- A traditional face painting ritual for the Yoruba Ori correlates with human destiny providing physical justification for punishment and moral responsibility in traditional and contemporary Yoruba traditions in this case, for cheating on a woman. The idea of putting markings on your face to describe who you are and the diaspora that goes with it is maybe where Beyonce is going with this. (diaspora- the idea of movement from ones original homeland). Further along in the song there is representation of the idea women with arms (in ancient African art this is seen as beauty) and a “crown” of hair showing natural beauty and heritage. Along with some more references to baptism and the idea of being reborn. Growing up as an African-American woman and being reborn as an African woman with deep roots that are not so broken by westernization. All Night: All night is the first time a man is visually represented. Throughout Beyonce’s entire album men are used sparingly. There is voice over of Malcolm X talking about the power of black women. Instead of condemning men for not speaking up enough or speaking too much about their masculinity Beyonce uses mens voices in conversation with the woman in her visual album. Formation: Although Formation is a large tribute to African American culture there is mention of creole food originating from Western Africa as well as referring to ladies to get in formation. Her entire album eludes to slavery and is filmed on a plantation relating back to her ancestors got to the Americas. There is also talk about the floods of New Orleans and police brutality. 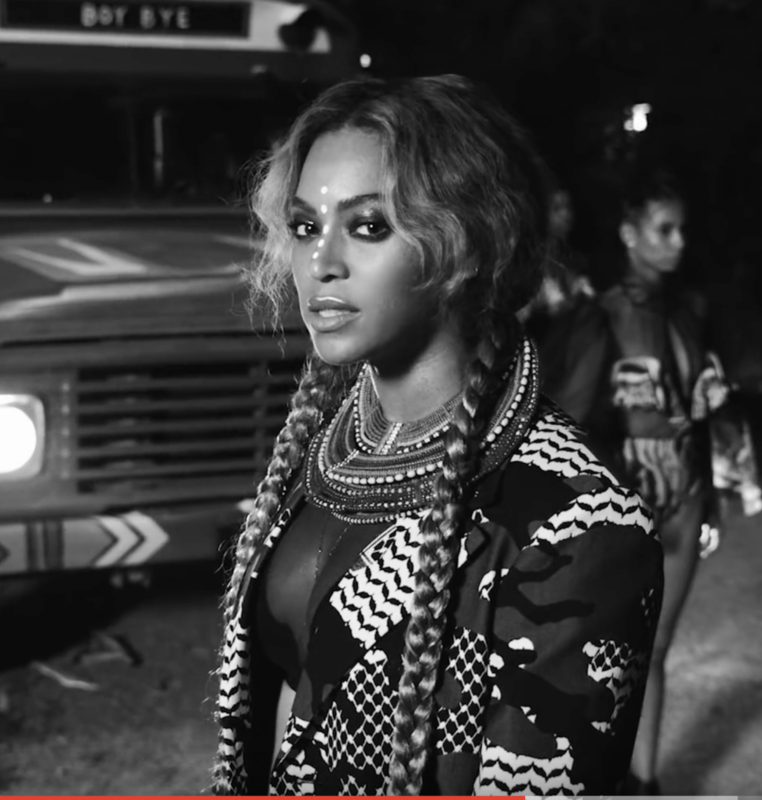 Beyonce is from Houston Texas and has grown up struggling through what it means to be an African American woman. She pays tribute to both where she grew up (Texas) and her cultural heritage of the Yoruba peoples. Yoruba religion and culture spread through the Americas with the transatlantic slave trade and provides rich culture for South America and the Caribbean. Yoruba peoples are known to have the largest birth rate of twins in the world. Twins are honored and seen as powerful within the Yoruba. When Beyonce announce that she will be having twins in July, 2017 she paid tribute to a Yoruba goddess Oshun in a photoshoot. Oshun is the goddess of love, beauty, prosperity, order, and not so surprisingly, fertility. (Oshun) She is the protector of the poor, the mother of all orphans, she is the one who brings you what you need in this life through periods of weakness or strength. Oshun is also know as Yalode, the mother of things outside the home ie. wealth. Due to being a prominate business women, as Beyonce is. A deeper look at general and power roles with women in the Yoruba culture. Woman are seen as extremely important and in traditional Yoruba culture they are worshipped. When creating the foundations of Yoruba religion and fundamental structure, woman played a central role. Religion, for the Yoruba, dictates everything from government to medicine and economics. The traditional Yoruba woman then would be a person who upholds the underlining principles of the people’s philosophy, including mutual gender and power relations and harmonious relations. The Idea of a harmonious relationship is very important in every aspect of the Yoruba life. The idea of Childbirth comes as a threat to men and their power within the Yoruba. Yoruba in Pop Culture Blog at WordPress.com.